Arkansas softball coach Courtney Deifel is in her third season. She led the Razorbacks to the NCAA Tournament in 2017. FAYETTEVILLE  Arkansas freshman pitcher Mary Haff remembers one of her first encounters with Razorbacks softball coach Courtney Deifel. Playing with the Rhode Island Thunder in a premier tournament in Colorado, Haff caught a glimpse of her soon-to-be coach. Deifel was pregnant with her first child, Trip, now 2 1/2 years old. Word of mouth brought Deifel to the park to see Haff in action. Haff dazzled throughout her prep career at Lake Region (Fla.) High School, where she finished with a 49-9 record, 0.72 ERA and 619 strikeouts. Haff saw Deifel's commitment that summer day in Colorado and knew she meant business. "I’m thinking she is too pregnant to be out here," Haff said with a laugh. "She was out recruiting even when she was pregnant, and I was like, ‘Wow, that’s a coach right there. She really wants to get stuff done.’ That really made an impression on me." Deifel and her staff found Haff late in the recruiting process. Haff broke her ankle during her prime recruiting year in high school, delaying communication with other programs. Ultimately, it worked out for Haff and Deifel. Haff is of the belief everything happens for a reason and viewed the injury as a blessing in a way. Deifel jumped at the chance to watch the star right-hander. "I went and saw her and was like, ‘Holy crap, she’s still available,'" said Deifel, now in her third season at Arkansas. "She was someone who when you walk up to the field you can see the break and almost hear the spin on her ball. You just know she has something special. It literally just lined up perfectly." Deifel was a catcher at California during her college playing days, winning a national championship and appearing in the Women's College World Series four times. The Bears never finished worse than fifth in the then-Pac-10 Conference, which Defiel likens to the present-day Southeastern Conference. Every weekend was a grind, she said. More than anything, though, she was appreciative of the trust her Cal coaches instilled in her and her teammates. In turn, it blossomed confidence. Deifel's Bears took on the underdog role, too, which is something she believes her Arkansas teams can latch on to. "We can surprise people on a daily basis," she said. "That’s the position we were always in at Cal. ... I look back and appreciate the coaches so much for letting us be us and letting us trust our strategy. I just value that experience so much." 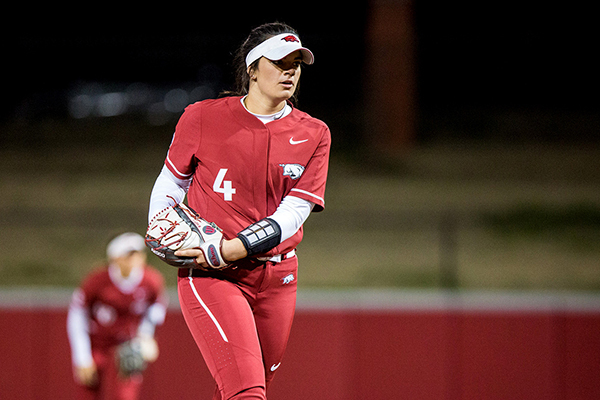 Arkansas freshman Mary Haff has won 15 games already as a freshman. She has a 0.74 ERA and has thrown a no-hitter. Deifel is passing that down to her players now. Haff has family ties to Arkansas, which went a long way in her committing to the program. But the liberties and expertise that Deifel, a former pitcher, offered in the circle was a key selling point. Friends of Haff who pitch at other schools have relayed stories of pitching coaches not giving up control in terms of pitching style. "(Deifel) works with what you have and not trying to create you into something you’re not," Haff said. "It helped me be able to embrace my strengths. For my pitching style, I’m glad she gave me freedoms to kind of be myself and not force me to be someone I don’t want to be. "Her just giving me different ideas and things that - not that I’m not used to them - but things I’ve never been exposed to before. She gives me a different set of eyes, and she’s really helped me." Being a former catcher, Deifel is often asked, "Why are you coaching pitching?" "For one, I grew up doing it, but sometimes it’s just working backward," Deifel said. "I understand the mechanics. I’ve caught 25 different rise balls, so I don’t just have my way of throwing a rise ball. It just broadens out your toolkit of what you can help your staff with. "I think the biggest thing that helps is pitch-calling, setup and strategy. That was my favorite part as a catcher. I loved having a hand in absolutely every pitch and handling every pitch and just the thinking piece you don’t get at a lot of positions. That’s what I love. Our pitching staff is doing alright." From Year 1 to Year 2 under Deifel, Arkansas' team ERA dropped from 6.98 to 2.82, leading to a 14-win improvement. Deifel's staff holds a 1.91 ERA through 31 games this season heading into a top-25 showdown this weekend against No. 20 Mississippi State at Bogle Park. Alongside Haff, the No. 23 Razorbacks have a strong complement in sophomore pitcher Autumn Storms. Storms is 9-4 with a 2.30 ERA; Haff is 15-2 with a 0.74 ERA. Together, the duo made history earlier this month, tossing no-hitters on back-to-back nights against Northern Colorado and Central Connecticut State. "It’s nice to have two pitchers that can be that dominant, you know? It’s nice to show we have two No. 1s," Deifel said. "To see those numbers with elite batters we’re facing (in the SEC), I think that’s a huge testament to their skill and their competitiveness. "Let’s attack the zone, be efficient, trust your pitches and trust your break." Outfielder Hannah McEwen, another of Deifel's freshmen, is having a strong year offensively. Haff's roommate and a San Diego native, McEwen is tied for the team lead with six home runs and leads Arkansas with 35 RBI. Haff says McEwen isn't one to get intimidated, and that's just what Deifel likes. "Her coming from California and a softball background I knew she would be amazing," Haff said. "She kind of has that personality where she doesn’t think anyone can strike her out." Young talent mixed with veteran leadership from Sydney Parr, Aly Manzo and others has sparked the Razorbacks' turnaround. Arkansas (25-6, 2-4 SEC) finished with a winning record last season for the first time since 2013. This year, Deifel is looking to nab the school's first winning conference season since then. "They welcomed us with open arms," Deifel said. "We can’t win it for them, they have to buy in. They’re a special group. ... I think our girls are doing a great job of stepping up in different roles. We’ve seen a willingness to do anything for the team."